Most of us associate a cold with the winter months, but anyone can get sick essentially anytime of the year. While the common cold is aggravated by dropping temperatures, it's actually a virus that can be spread no matter what the weather may be like. Any doctor will tell you that there is no wonder medication to cure the virus. However, that doesn’t mean you just have to suffer for a few weeks. Natural remedies you can find right in your home or in the grocery store can help to ease the symptoms of a cold. So here are some natural remedies you can try at home yourself if a cold strickes your household. One tablespoon of salt (Try natural organic sea salt if you can. But table salt will work as well). After you have mixed the salt in so that it thoroughly dissolves, gargle with it for at least 5-10 seconds. Try to go through the whole glass of water. If you gargle two to three times a day, this can relieve the sore throat. While vitamin C will not relieve your symptoms of the cold, it will help you to recover more quickly. This vitamin is a natural immune system booster. Because it is water based, you can take it in higher dosages while you are sick. The more you can boost your immune system, the quicker your body can recover from any illness. These supplements are available over the counter at a grocery store, a supercenter, or a vitamin shop. While the netty pot is actually a very old concept, it has become more popular in recent years. Often simply referred to as nasal rinsing, this method involves rinsing your nasal passages with a saline solution. If you have the iconic stuffy nose from a cold, the rinse will relieve the congestion without any side effects of decongestant medication. Some people feel that daily nasal rinsing will help to keep the cold away since the netty pot will rinse away any germs in the nose. Back in the 1990s, an extensive study showed that a zinc supplement can shorten the length of the common cold. As with vitamin C, zinc will not cure your symptoms, but can make the illness last a shorter amount of time. The study showed that the common cold usually lasts almost eight days. In patients who took a zinc supplement, the cold time was shortened to just over four days. 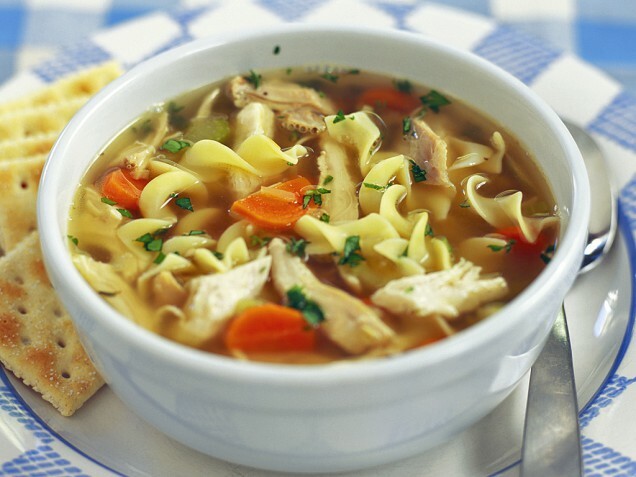 There is a reason why your grandmother suggests a warm bowl of chicken noodle soup anytime you get sick. While soup has no medicinal qualities, it can help soothe the symptoms of your cold. The warmth of the broth will ease inflammation in your throat. Consuming the soothing soup will help you avoid dehydration, which can be a common problem when you are fighting a cold. Everyone will suffer from a cold at least once in their lifetime. The virus is too common. While you can’t get a medication from the doctor to cure the cold, you can use natural remedies to ease the symptoms. So try these natural remedies to help shorten the length of your illness so you can get back to your daily life. I just recently caught a cold, and I am making sure to do all these things listed. Great post!